The Cooper Cup Regatta will be held on Sunday, April 28, 2019. Registration is located on Regatta Central (opening in late March). The Cooper Cup Committee is currently seeking sponsorship for this years event, all information is located here or email us with any further questions. Winter Training is underway to prepare for the upcoming Spring Racing Season. Any winter sport athletes looking to try a new spring sport please contact us. Below is the address for our warehouse training location and the practice schedule. Warehouse address is 11000 Commerce Parkway, Mount Laurel, NJ. Training Schedule Tuesday thru Fridays, 4:00 PM to 6:30 PM. Saturdays are in the AM, with the guys at 7 AM and girls at 9 AM. The 2018-19 Spring Racing season will begin Saturday, December 1st with warehouse move-in. The spring racing program is open to any high school athlete (no experience required) looking to train on a highly competitive level. South Jersey is looking to continue to build on the club's most successful spring season last spring, with six boats advancing to Youth Nationals, with two of the crews finishing in the top six in the Nation. The 2018-19 Spring racing schedule is located here, we may make some minor adjustments as we look for additional racing opportunities. Registration is open on Regatta Central (under Clubs ->South Jersey Rowing Club). Please contact the club with any questions regarding our program. The 2019 Spring Middle School Program will start on Monday, February 4th at 6 PM until 7:30/45 PM and run thru Sunday June 2nd. The program is open to any student in grades 6th thru 8th. No experience is necessary to enter the program. Registration is located on Regatta Central (under Clubs -> South Jersey Rowing) and the program is capped at 28 athletes for the Fall Season. Any questions please email the club. SJRC brought home it's FIRST National Championship in June 2017 winning the Women's Youth 2x in Sarasota, FL. The victory came down to the wire winning over Cambridge Boat Club by less than one second, but were in control from start to finish. The 2018 Spring Rowing Season was the most successful spring racing season for South Jersey. The team advanced six boats to the Youth National Championship Regatta, with tow of them finishing in the top six of their event in the nation. All crews qualified by placing in the top three positions at the USRowing Mid-Atlantics event in May. SJRC athletes continue to out perform their goals set from the first day of training. South Jersey Rowing Club and the Camden County Boathouse were awarded the 2018 USRowing Club Nationals. The five day regatta is held in July 2018. 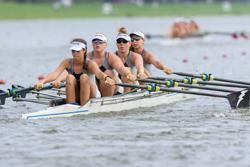 SJRC Alumnist Rose Carr BRONZE medal at WORLDS! Rose Carr three seat in the USA Women's 4- took a Bronze medal at the World Junior Rowing Championships. Fusion is much more than an accredited private middle and high school for grades 6 - 12 - it's a revolutionary community of learning where positive relationships and one-to-one classrooms unlock the academic potential in every student and create opportunities for emotional and social growth. Sir Lancellot, is a full-service courier service specializing in time critical delivery to Philadelphia metropolitan health care, financial, business, manufacturing and distribution organizations. King Marine, a family run business located in Sewell, NJ, maintains our fleet of coaches launches. From routine repairs, to winter storage, and everything in between the staff at King is always there to help the club out. Somerset Properties is a full-service real estate investment and operating company. Since 1996 Somerset Properties has been delivering creative property solutions, above-market returns, and best-in-class service to its Family Office and Institutional investor partners. Interested in becoming a sponsor of South Jersey Rowing Club? Please email to inquire about sponsorship options. Insurance Broker. Benefits Consultant. Business Partner. GFS is committed to transforming the next generation into excellent students, great athletes, and extraordinary people. ©2019 South Jersey Rowing Club / SportsEngine. All Rights Reserved.